Farm-to-table dining is more than a trend. In communities across Wisconsin, people are demanding more sustainably and locally produced foods - and craving opportunities to learn about how these foods are produced. Some small family farms in Wisconsin are providing a unique (and direct) take on farm-to-table by providing idyllic dining experiences inside refurbished barns and on hillsides overlooking active pastureland. 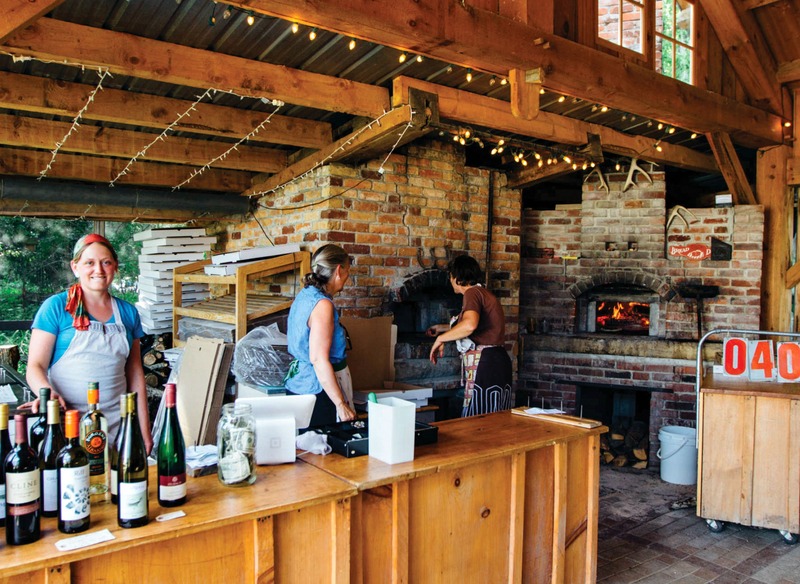 While farms of all stripes offer these dining experiences, a specific type of on-farm dining has risen to the top over recent years: the pizza farm. The originators of the pizza farm concept, veteran farmers Robbi Bannen and Ted Fisher, never really expected their "unplanned" idea to take off. The couple was struggling to keep up with delivering produce through their community supported agriculture (CSA) program and lugging it to regional farmers' markets. So Bannen and Fisher struck upon a way to have customers to come to their farm in Stockholm, which is located about an hour southwest of Eau Claire near the Mississippi River. Both had extensive experience working in restaurants and decided on a whim to build a wood-fired oven out of locally sourced brick and construct a commercial kitchen in their barn. Bannen says they opened A to Z Produce and Bakery in 1998 "to make sourdough bread and use the things that we grew to make pizza." A to Z's motto, "Where the farm is the table," sums up the experience. Diners bring their own chairs and picnic blankets and settle in a spot surrounded by the very vegetables that they will enjoy on their pizza, from tomatoes in the sauce to radicchio, shallots, and other innovative toppings. Pigs, sheep, and cattle languidly graze, keeping the fields fertile and (eventually) providing delicious meats for toppings like A to Z's homemade lamb sausage. Bannen creates her own pizza crust and bread using wheat that is harvested and stone ground right on the farm. "We really love doing what we're doing. For us it's always been about making great tasting food," says Bannen. "It's not that easy to make a living selling vegetables, [but making pizzas] allows us to keep growing vegetables." 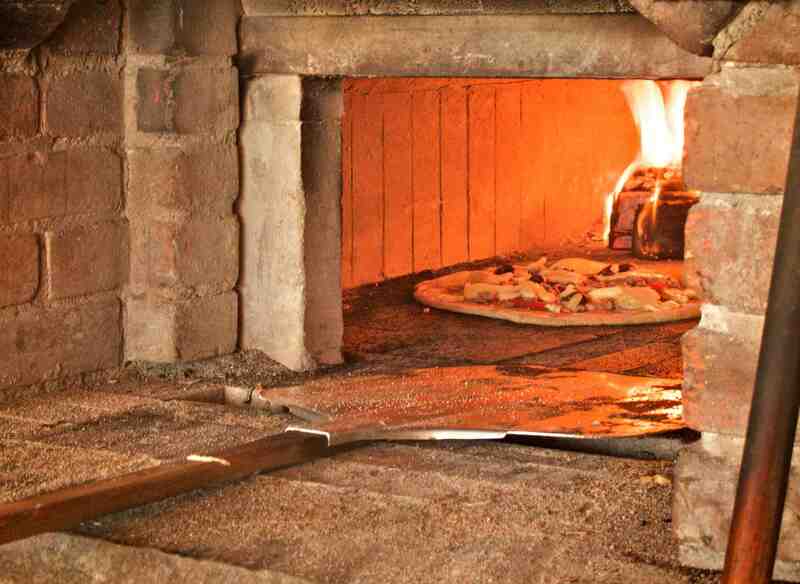 Fisher works the brick oven on Tuesday pizza nights, from March to October. Deep into the summer months, the farm is bustling like a fairground and diners can expect upwards of an hour wait for their specialty pies. While the off-season is quieter, Bannen says that she typically works "sixteen-hour days, seven days a week." Their customers have definitely changed since 1998. "Twenty years ago, everybody that came here had a farm in their history," says Bannen. "That's just not true anymore because of the lack of the farmers in the landscape." Once home to thousands of predominantly small to medium-sized family farms, Wisconsin has seen a marked loss of both farms and farmland over the past decade. Bannen says that even though people are further and further removed from the farming experience, she's noticed a deep personal connection with the land emerge in people who visit their farm - especially young people. This helps her stay hopeful about the future of small farms in America. "You don't decide you're going to connect somebody to the land, but it can happen," she says. "And for that brief period of time when we're open, people get to feel like it's theirs." To say that Tony Schultz, who refers to Bannen and Fisher as the "godmother and godfather" of pizza farms, was influenced by A to Z's model is putting it lightly. Schultz, along with wife Kat Becker, is owner and operator of Stoney Acres Farm in Athens, which is about half an hour west of Wausau. Schultz takes the concept of locally sourced very seriously. Even though he doesn't produce his own pizza cheese, Schultz sources his base of Monterey Jack and mozzarella from nearby Bletsoe's Cheese - and Bletsoe's uses only milk from dairy farmers within a 10-mile radius. Other artisan cheeses that end up on Schultz's pies come from across the state: blue cheese from Black River Blue, fresh mozzarella from Crave Brothers Farmstead Classics in Waterloo, and gouda from Marieke Gouda in Thorp. Like A to Z's pizza, everything else on a Stoney Acres pizza has been grown or created right on the farm. Organic wheat is grown, harvested, and freshly ground into flour for the homemade dough. Schultz's sage, oregano, and basil are used for the homemade sauce, as are his tomatoes and toppings such as mushrooms, onions, butternut squash, rainbow beets, kale, broccoli, and peppers, just to name a few. Schultz's pastured pigs are processed locally by Custom Meats of Marathon or Geiss Meat Service in Merrill, and cured into ham, prosciutto, and bacon, all without the use of nitrates. His grass-fed cows are butchered only in early summer or early fall, after the largest flushes of cool season grasses and clovers, adding to the flavor and nutritional quality of the meats, which are then dry-aged for at least two weeks at Custom Meats. For Schultz, locally sourced means supporting the community in which he was raised. Schultz, who grew up on Stoney Acres when it was a 50-cow conventional dairy operation, is a third-generation farmer; the farm has been in his family since the 1940s. 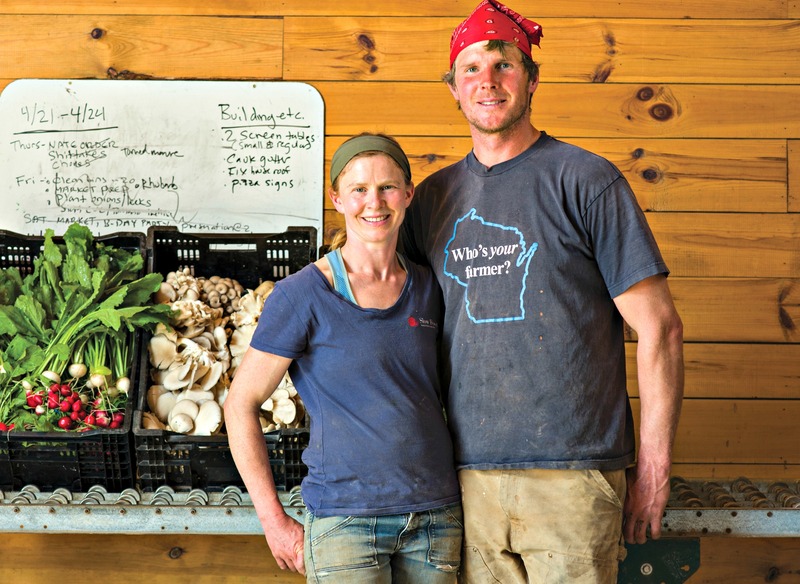 After earning his degree at UW-Madison in 2004, Schultz took over and converted the operation to an organic farm. He started marketing his produce through the Wausau Farmers' Market, and was integral in starting the Wausau Winter Market, both of which are located near the riverfront in the heart of downtown. In 2007 he opened a community supported agriculture business, which has grown from delivering fresh vegetables to 72 members to 200 members today. It was in 2012, at a Farmers Union meeting, that Schultz met Bannen and Fisher and first heard about their pizza farm concept. And he decided to "steal" the idea, as he likes to put it, but he ensures that credit is always given where due. "This idea originated in the Midwest, Western Wisconsin. Take that, East Coast," quips Schultz. Visitors to Stoney Acres are in for a true Wisconsin farm experience, with cows grazing, pigs rooting around, and an occasional rogue chicken wandering out of the coop. Kids are free to run around, explore, even dig in the horseshoe pit that substitutes as a sandbox. Adults can relax on the lawn and watch the sunset, or stroll the grounds while they wait for their wood-fired pies. If it rains, no problem: a renovated granary seats up to a hundred people. The farm is open to the public for pizza every Friday, from late April to early November. New this year, Stoney Acres is also opening its doors on Saturdays to customers who purchase tickets online. Schultz and Becker work three brick ovens, which are started the night before in order to reach the 900 degrees required to cook the pizzas in about five minutes. Diners are welcome to bring other foods to supplement the pies and can also enjoy a local brew or mead from a new beer garden opened just last year. Schultz says that seasonality is "the inspiration and muse" for the pizzas. But there's also a sense of place that comes through in each pizza, a real flavor of the land and all of its bounty. "We're doing ramps now, microgreens are coming out of the hoop house, arugula is coming out of the fields, and I foraged some fiddleheads which were sticking out of the forest floor," he says. But Schultz stresses that Stoney Acres is a farm first - 80 percent of his time during the week is dedicated to tending his vegetable crops and maintaining his produce business. 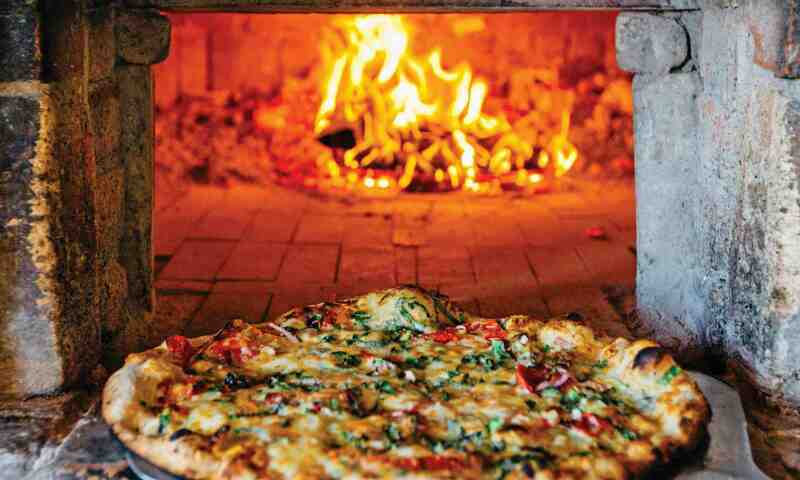 The pizza element allows the farm to open its doors to friends, neighbors, and others to showcase its beauty and functionality, while diversifying his revenue stream. At a time when industrial farming deeply influences the foods we purchase and the way we prepare them, small farms are rethinking how they deliver their products, maintain their businesses, and support their families. As more consumers become invested in learning about where their food comes from and how it is grown and prepared for market, small family farms can benefit. "I care about food first," says Schultz, noting how a great meal can bring people together from different backgrounds. "Pizza is the perfect food [because] it bridges certain food experiences. My neighbors are here eating my arugula on my pizza, people drive from Minneapolis or Chicago or Madison to a small town in central Wisconsin to have pizza on our farm. Serving this type of food and producing food in this way brings so many people out to the farm. It makes us successful." This article was originally published in the Spring 2017 issue of Wisconsin People & Ideas, and is copyrighted to the Wisconsin Academy of Sciences, Arts & Letters. WisContext is a partnership between Wisconsin Public Radio, Wisconsin Public Television and Cooperative Extension.